Ship to shore gantry cranes for container or for container and cargo dual purpose, rail any gauge but prefer 50 feet, in good working condition, any age, any make. Also, needing Harbour Cranes (Gottwald and Liebherr). Think You Know It All ? Burn shipboard waste and sludge in rugged and efficient THERM-TEC Mariner incinerators. The first and only US built, IMO, USCG, ABS approved equipment. We also supply leased containerized incineration plants for open deck use. THERM-TEC Inc. www.thermtecmarine.com e-mail: carolina@teleport.com Phone: 503-978-0863 parataria Hofttng Company, 3nc. 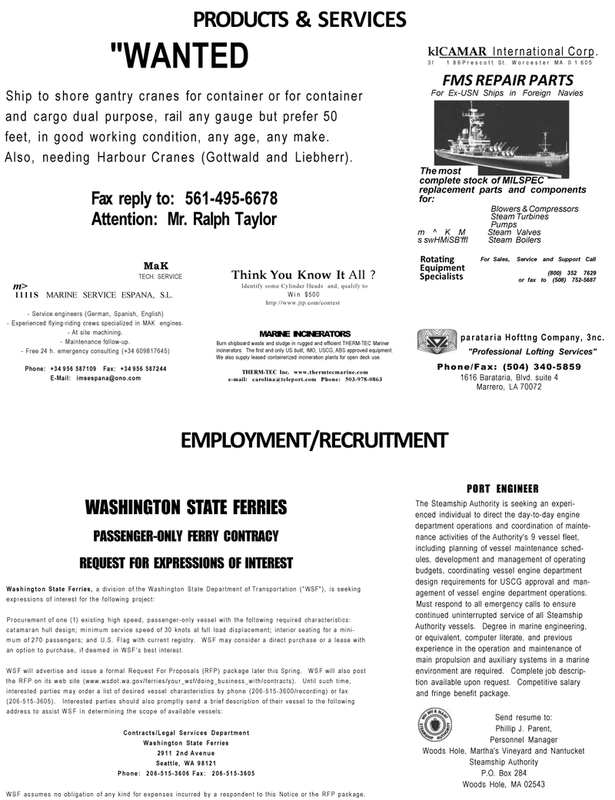 "Professional Lofting Services"
Procurement of one (1) existing high speed, passenger-only vessel with the following required characteristics: catamaran hull design; minimum service speed of 30 knots at full load displacement; interior seating for a mini- mum of 270 passengers; and U.S. Flag with current registry. WSF may consider a direct purchase or a lease with an option to purchase, if deemed in WSF's best interest. WSF assumes no obligation of any kind for expenses incurred by a respondent to this Notice or the RFP package. The Steamship Authority is seeking an experi- enced individual to direct the day-to-day engine department operations and coordination of mainte- nance activities of the Authority's 9 vessel fleet, including planning of vessel maintenance sched- ules, development and management of operating budgets, coordinating vessel engine department design requirements for USCG approval and man- agement of vessel engine department operations. Authority vessels. Degree in marine engineering, or equivalent, computer literate, and previous experience in the operation and maintenance of main propulsion and auxiliary systems in a marine environment are required. Complete job descrip- tion available upon request. Competitive salary and fringe benefit package.